Videos, worksheets, stories and songs to help Grade 6 students learn about types of angles: acute angles, right angles, obtuse angles, straight angles, reflex angles and full rotation angles. Right Angle (Quarter-Turn) – Two rays that connect to form a square corner. Straight Angle (Half Turn) – Two rays that connect to form a straight line. Obtuse Angle – An angle with a measure greater than a right angle but less than a straight angle. Reflex Angle – An angle with a measure greater than a straight angle. Note that an acute or obtuse also has a reflex angle on the outside of its arms. 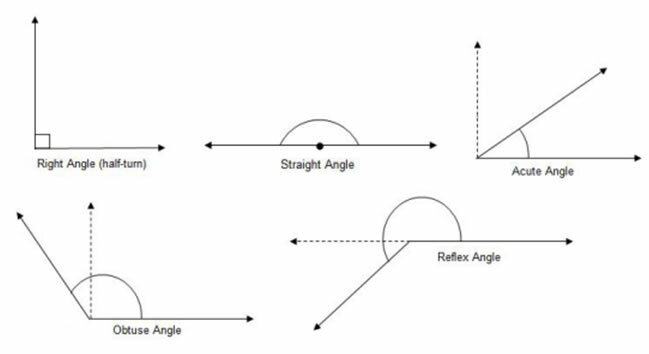 The following figures show the different types of angles: Right angle, Straight angle, Acute angle, Obtuse angle and Reflex angle. Scroll down the page for more examples and solutions. Angles are used to measure the amount of turn. This video shows you what angles are, how they are created, and the main types of angles we use in math. Identify acute, obtuse and right angles. What is an angle is and how angles are measured? It demonstrates the measuring of angles with a protractor. It goes over different classifications of angles such as acute angles, right angles, obtuse angles, straight angles, reflex angles and full rotation angles. Name the vertex and sides of an angle and give all the possible names of the angle. A song about the types of angles and the degrees of the different types of angles. This video illustrates acute, right, obtuse, straight, reflex, and full angles.